IN AN UNPRECEDENTED MOVE, County Louth republican Thomas Murphy has been convicted in the non-jury Special Criminal Court for not filing tax returns and sentenced to 18 months in prison. His solicitors said he will launch an immediate appeal. It is the first time that the court – sitting without a jury and presided over by three judges – has been used to try someone for not filing tax returns – and for an amount of just €4,279 per year. 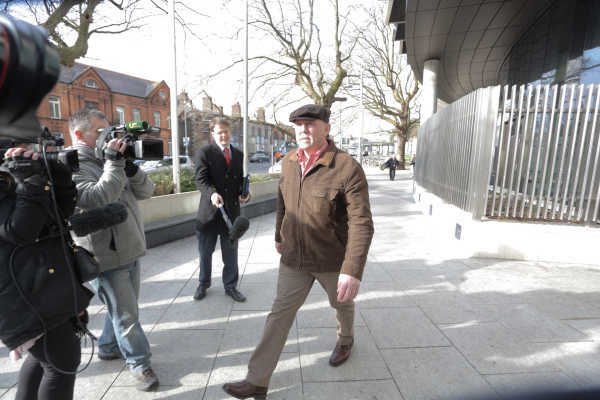 Thomas Murphy (66) had been convicted last December of nine charges of failing to comply with tax laws. In 2001, then Fine Gael leader Michael Noonan revealed (just before it was to be reported by a newspaper) that his party had made a £111,000 payment to the Revenue Commissioners as a settlement for illegal under-the-counter cash payments to Fine Gael staff. Thomas Murphy's Special Criminal Court sentencing comes in the same week that former Fine Gael TD Michael Lowry lost his High Court bid to stop his trial on tax charges relating to a €372,000 transaction in 2002. “I am an Irish republican and have been all my life. “For many years now I have been the subject of serial, prejudicial and wholly inaccurate commentary and media coverage. There have also been repeated assertions that I have amassed properties and wealth. This is utterly untrue. I do not own any property at all and I have no savings. “Further, with regard to my recent trial, it was alleged by one broadcaster that two people who had given statements to An Garda Síochána felt unable to give evidence in court and there was a suggestion of intimidation of these witnesses. “The witnesses did give evidence. The prosecution legal team did not even allege there was witness intimidation. “Despite never having been questioned by An Gárda Síochána in relation to Revenue matters I was arrested, charged and put on trial in the Special Criminal Court for failing to file tax returns in respect of farming. “The case presented against me was that tax returns with an average liability of €4,279 tax per annum should have been filed by me over a nine-year period in relation to farming. “The evidence called by the prosecution showed that tax returns were made by family members in respect of the farm and that all tax on any profit from farming has been paid. “I maintain my innocence in respect of these charges which date back 20 years.